The history of the Jesuits in America is largely a story of movement—one of crossing first an ocean, then lakes and rivers and ultimately traversing ethnic, linguistic and ideological boundaries. Those journeys ended with a series of dwelling places where both the mind and spirit could expand. It is a story exquisitely told in a new exhibit at the Loyola University Museum of Art in Chicago called "Crossings and Dwellings." The exhibit focuses largely on the Midwest, where the Society left one of its most significant imprints on the American landscape. Designed to commemorate the 200th anniversary of the Jesuit restoration, the show also celebrates 100 years of women’s education in Chicago, where the Jesuits collaborated with two large women’s religious orders to educate tens of thousands of students, both Catholic and Protestant. The story begins in Europe where, by the late 17th century, the Jesuits had accumulated a host of enemies. Royalists accused them of trying to subvert the monarchies. Anti-monarchists felt they were too cozy with the ruling classes. Some fellow clerics complained they had “gone native” in their missionary work. The insistent turmoil put political pressure on the papacy. In 1773, Pope Clement XIV officially suppressed the Society. Arrogance might have been one of the few accusations against the Jesuits that was actually true. Crossings and Dwellings includes a drawing called “The Ship of Salvation” which hung in a Jesuit college in Auvergne. It shows a ship captained by St. Ignatius and steered by various Jesuits who toss a lifeline to the drowning pope. At the time of suppression, settlements in the New World were expanding apace. When the order returned to good graces in 1814, America presented a new location for its priests to exercise their missionary zeal. The exhibit begins with a flint cross-carried by Pere Jacques Marquette, one of the first Jesuits to arrive here from Europe. But it focuses on two other émigrés pivotal to the American story, Father Pierre Jean De Smet and Father Arnold Damen. Neither man would have been nearly as successful without the help of European religious sisters who followed, and worked beside them. De Smet was from what is now Belgium. He immigrated to Florissant, Mo., outside of St. Louis. With Rose Philippine Duchesne (later canonized) and other sisters of the Religious Congregation of the Sacred Heart of Jesus, De Smet established schools in the St. Louis area before there was any other public education in Missouri. He went on to minister to Native Americans further west, but the sisters stayed to educate the burgeoning number of immigrant children. One of De Smet’s protégés was the Dutch priest Arnold Damen, who made his way from St. Louis to another fast-growing city of immigrants, Chicago. Damen founded Holy Family Church in 1860, the first Jesuit parish in Chicago, a towering masterpiece of baroque architecture that still stands today. In 1869, Damen established St. Ignatius College, the precursor of Loyola University. Jesuits educated boys, while the Sisters of Charity of the Blessed Virgin Mary focused on girls, founding two academies in Chicago and later Mundelein College for women. The B.V.M. sisters matched the Jesuits in the drive to educate, breaking ground for Mundelein College at the start of the Depression and overseeing the construction of what remains a gem of art deco architecture on Chicago’s north side. The exhibit celebrates the 100th anniversary of Mundelein, which merged with Loyola in 1991. Mundelein educated hundreds of Chicago school teachers and was a leader in promoting social justice and civil rights. One of its graduates, who figures prominently in the exhibit, is Ann Marie Lally, the daughter of Irish immigrants who headed an all-black public school in the 1950s and went on the become a Chicago district schools superintendent. The Jesuits’ early focus on intellectual pursuits is mirrored in such items in the exhibit as an original copy of the Ratio Institutio Studiorum, the regimen of Greek, Latin and humanities studies that Jesuit schools followed. Among the more stunning items are two 17th-century wooden globes created by map maker Willem Jansz Blaeu, one showing the terrestrial world as it was known at the time, the other depicting the constellations. The globes belonged to Father De Smet, who carted them back on one of his many voyages from Europe, where he went frequently to beg for funds. These are the only pair of Blaeu globes of their kind known to still exist in the Western hemisphere. The Jesuits were quick to adapt to their new environment. They soon recognized that the classical educational model they followed in Europe wasn’t working for the young immigrants they were called to teach in America. They began focusing on the commercial arts and sciences. The exhibit displays a galvanometer and electrostatic machine from the early 20th century used in physics classes at St. Ignatius high school, and a letter press used by the Blessed Virgin Mary sisters to print holy cards for the students. 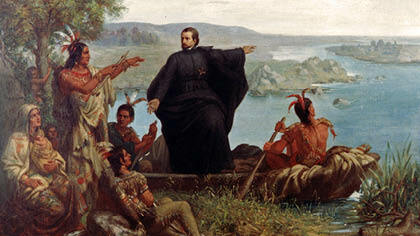 There are many exquisite works of art and handicrafts including drawings of Indian life and frontier settlements by Father Nicolas Point; a first edition printed copy of the Spiritual Exercises; a deerskin coat worn by Father De Smet; a wooden Madonna and Child carved by the Potawatomi Indians, as well as monstrances, vestments and altar vessels. Some of the items carry touching stories, including a prayer book used by Jesuits for the baptism of children about to die; a priest’s diary account of the plundering of the Jesuit college in Rome; and a pew door from Holy Family Church, donated by a family whose son entered the Jesuits, only to die soon afterward of tuberculosis. For bibliophiles, there are reproductions of pages from some of the 10,000 rare books that were once housed at the St. Ignatius College Library. Still, the exhibit underscores some regrettable aspects of the Society’s past. Even though the order established the first parish for African Americans outside of St. Louis after the Civil War, Jesuit missionaries just a few years earlier had arrived there with their own slaves in tow. And Father De Smet’s grand plan for Native Americans in the West was to help them establish a republic of their own—but only after he converted them to Catholicism. Crossings and Dwellings brings together major threads of the Jesuit story. It is an invaluable tool for understanding the importance of the Midwest to American Catholicism and the debt owed to Jesuits and women’s religious orders in educating the people of the fledgling American nation. The exhibit continues through October 19. A conference based on the exhibit, Crossings and Dwellings: Restored Jesuits, Women Religious, American Experience, 1814-2014, will bring together educators, historians and theologians to comment on the Jesuits and the American Catholic experience. It will take place at Loyola’s Water Tower campus in downtown Chicago, October 16-18. Judith Valente, a regular contributor to NPR and "Religion and Ethics Newsweekly" on PBS-TV, is America's Chicago correspondent.